This Year March Madness Means GREEN! It is almost time for the NCAA® college basketball tournament, or rather March Madness – it’s that crazy and exciting time of year when people who don’t typically follow college basketball join the faithful and watch every game. This year the Men’s Final Four® will be held in Arlington, Texas at AT&T Stadium on April 5 and April 7 and the NCAA has teamed up with the Local Organizing Committee on some great sustainability initiatives throughout North Texas. City officials are working with the NCAA to plant 1,014 trees throughout Arlington. This initiative kicked off on February 12 with the planting of four trees. A 2009 study showed that only 22 percent of Arlington’s land mass was covered with trees. 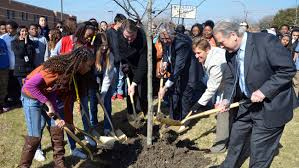 With this in mind Arlington’s mayor, Dr. Robert Cluck is calling on residents to continue this momentum and plant another 10,000 trees over the next 10 years. Public transportation reduces the consumption of fossil fuels and the impact burning these fuels has on the environment. In order to help fans get around Arlington during the last two games of the tourney, the NCAA and the North Texas Local Organizing Committee have worked with state officials and transit authorities to create the Fan Express. This combination of rail and bus service is designed to get ticketholders to the big games quickly and sustainably. Renew. Reduce. Replay. Start with Art! North Texas artists have been asked to participate in a project known as Renew. Reduce. Replay. Start with Art! Local artists will create artwork constructed from sustainable or recycled materials to showcase the power of recycling. By utilizing recycled materials as a form of art, people will see the beauty of recycling and be able to appreciate the impact these materials have on their community. The artwork will be on display at locations throughout North Texas. All venues hosting events will focus on recycling to ensure items are properly disposed of and will be put to good use. To further up the eco ante, the Kay Bailey Hutchison Convention Center in Dallas will compost during the festivities (for the first time!). Unused food items left over from events will also be donated and visitors will have the option to pick up recycling bags when they enter the stadium parking lots. Great Job Arlington and NCAA on Going Green! An event like the Final Four is great for the host city simply in terms of the revenue generated, but it is great to see Arlington officials partner with the NCAA and the people of North Texas to make this experience green. Some creative thinking and small changes will reduce the environmental impact of the exciting conclusion to this tournament and these changes are not simply thrown in place to just to make this event green. Many of these changes will be lasting and the educational aspect is geared to make a long-term impact, so North Texas will be able to continue to put these green ideas into play long after the winning team leaves town. 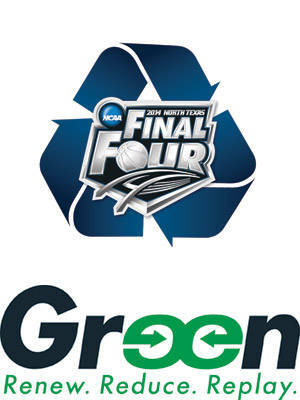 Good to hear the NCAA and the Final Four are taking steps to go green. But a fair reading of the greenness (or lack thereof) of March Madness would need to take into account the way the NCAA ships teams (and their fans) all over the country over a three week span. For example, you have Michigan State going out to Spokane for the first two rounds, then to NYC for the regionals. Is that green? I know it’s not easy and competitive balance is an issue but, if the NCAA truly was interested in greening, they’d make a better effort at minimizing travel.